Alana McGillis is an awesome and hilarious paleoartist whose recently published book, “Daring to Dig: Women in American Paleontology” is the best book you’ll read all year. It’s an awesome combination of amazing facts, stories, and gorgeous illustration and it’s available now from the Paleontology Research Institution in Ithaca, New York! Alana is a graduate of Smith College in Massachusetts, where she fell in love with geology and storytelling, and now works in outreach at San Francisco Maritime National Park. Meaghan sat down with her for a Skype interview. 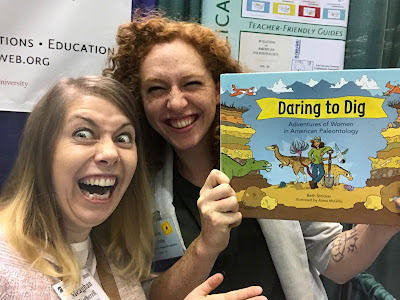 Read the below interview for information about Alana, information about the book, and some really, really good cat geology puns - and for more of all three of those things, you can visit her website at https://www.alanamcgillis.com, or follow her on twitter at @GilisDoodles! ...wait u guys don't do that when ur excited? Meaghan: Tell me about working at the Paleontology Research Institution in Ithaca New York! Alana: It was a very cool job, I liked it a lot! I was actually hired initially as an internship at the Museum of the Earth, making comics. The director afterwards offered me a job as an assistant - he said “hey I can't offer you a job making comics, but I can offer you a job as my assistant and we’ll see what happens!” But I was an awful assistant! I should have been fired, I was the worst - I missed emails, I triple booked him, I was awful. So pretty sad because I really loved working there, but then he came back at me a few months later was like “hey you want to illustrate this book on lady scientists?” and I was like “that's basically my dream job, so... YES!” So I got really lucky just to be where I was at the right time ‘cuz women in paleo has been something I really loved since I was in college and it was insane to be able to do my two favorite things, which was to draw and learn about all these great ladies and their science! Meaghan: I mean who doesn't like those things right? 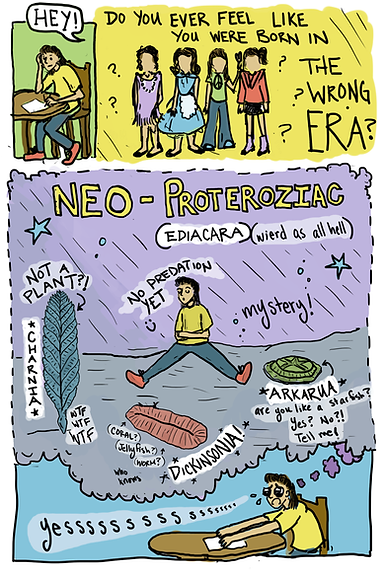 So how did you get to become such a giant geology paleontology cartooning nerd? Meaghan: WHAT? And you got hooked off of foraminfera?? Alana: Yeah! I got hooked on the microscopic stuff, because there's just so much love and dedication poured into these tiny things. People are uncovering the mysteries of the Earth, all using these tiny things! And I love to draw really tiny things so it felt nice to be able to do that. Then I realized my senior year of college that I wasn't going to be a research scientist. It wasn't that I was bad at it, it's just that I wasn't happy. The only part that I really liked about geology was when I got to tell everybody else about how amazing it was! So I started doodling and I was asking around a little, like, is there a way to be a... geology doodler? Is that a thing? Is that a career path that I could take? Meaghan: What’s your favorite thing to draw? Alana: I just love earth science! The feeling that I had in my first earth science class was just like Oh my God, I can't believe that there are answers to these questions, and also questions that I haven't been asking! I get that kind of feeling when I get to draw that sort of stuff, geology stuff. I've got one about the ediacaran fauna that I love. That’s probably my favorite period of time, it's so weird! But I love drawing anything that just makes me feel like, Geology is nuts, man! Everybody should get in on this! Alana: I draw a lot of cephalopods. That’s just kind of what comes out. The book is a crazy project because I've been drawing for a long time but I definitely didn't feel like an illustrator, even when I was doing actual science illustrations in a museum. This is the first time that I'm like, oh no I did a thing! Meaghan: Many of your Doodles and illustrations revolve around cat puns, so let's be honest how many cats do you have? Alana: I think a lot of that cat puns come from me wanting a cat. I want to write this book that is called Learning Geology with Cats, and I don't know if anyone would buy that. I just thought it would be fun to compile all of my doodles into something. Meaghan: I would use it, I would teach with that book for sure! 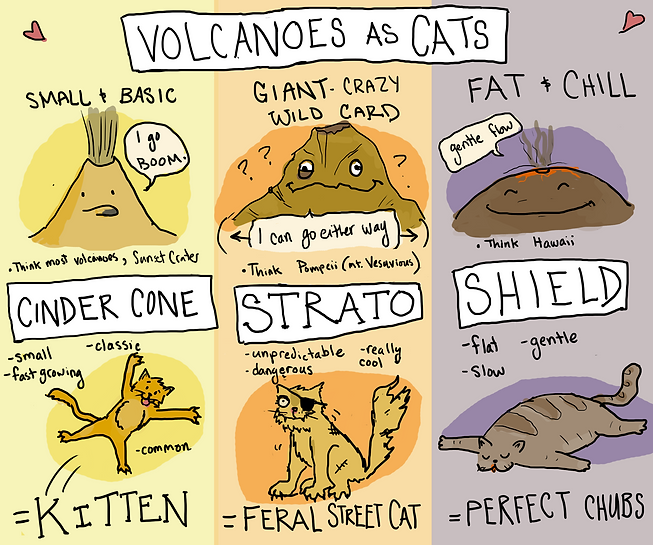 Alana: I also thought maybe about just making posters, especially the volcanoes as cat one because that seems pretty popular. I’ve got a divergent plate boundary doodle with pizza, I've got a convergent plate boundary doodle with cats, but I don't have one for transform yet so I've got to think about that one! It's been in the back of my head for forever. Meaghan: So how did this project get started? Alana: Beth Stricker, who’s the author, who started the whole project - she's just got so much knowledge! When I first started working at the Museum she kind of just accosted me with this humongous book and file of all this stuff, and it was like Christmas! Like, ah, I can't believe you have all this information about all these ladies! Beth and I used to spend nearly every week for about 5 months just Skyping and checking in. She had completed the research pretty much at the beginning of the process, and then it was me working for months and months drawing and then coming back to the museum. I got this email once that was like Alana we need you to fix something, the moon snail on the left-hand corner of this page is a juvenile but she did not find a juvenile! This is a tiny background detail, without even a label, but I love working with scientists who are so accurate! Meaghan: Were there any surprises along the way, any scientists that you learned about that you hadn’t known about before? Alana: Yes! Winifred Goldring. She's one of my favorites! I'm a little disappointed that I didn't draw her in pants because she was all about field pants and she would mail them to other geologists like, “you have to try these new things, these are called pants.” Another person in the book gets a package of pants from her, and so I drew a tiny little package on her desk. 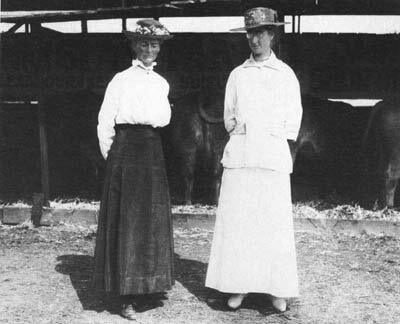 I love that there are relationships between these ladies, like Katherine Palmer and Carlotta Maury were both students at Cornell and were best bros, so there's lots of photos of them hanging out together. Esther Applin and her two friends Alva and Hedwig helped her revolutionize the oil industry, so there were just these three 20-something young ladies changing the world! There's just a lot of lady friendships in the book that make me very very happy, and there were some women that didn't make it into the book that were also in this community. Early illustration of "Daring to Dig", see the updated version in the book! Meaghan: Who are your favorite people that you encountered while writing this book? Alana: I think my most favorite is Tilly Edinger. She was German and she was Jewish and she started the field of paleoneurology. She was really interested in horse brains. There aren't many natural horse endocasts (brain fossils) so she made her own out of skulls and some rubber! She was mostly interested in horse brain evolution. But she was Jewish and she was living in Germany when the Nazis were a thing, and she had to hide out and her whole family died. She was able to come to the U.S. because other influential paleontologists were able to convince the government to protect her. She was deaf, too, so she had a lot of things of things to overcome, and she did a crazy amount of work anyway! She was just one of the coolest women to read about. Alana: - she's very cool and she is very quirky, she drove around in a motor car with a little side car. There are lots of photos of her in the side car, and in pants, just running around. 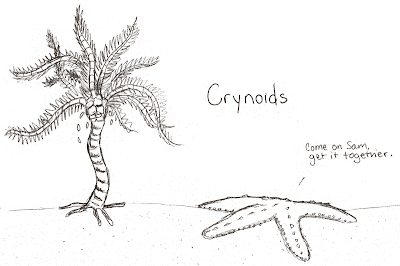 She wrote this crazy book about crinoids that's like 700 pages long. Not actually from that book, but presumably very similar in content. Alana: There's just so many that we couldn’t manage to fit in, which is why it's really cool that they're actually going to make an exhibit out of it! Alana: It's gonna be this huge beautiful exhibit and it will go to all these museums across the country, and we'll talk about all these women in more depth and a lot of more modern women as well. We're going to be doing interviews - I don't know how many years we've been doing it for - but at GSA they're going to interview modern female paleontologists and work to preserve their stories. I just hope that girls read it! And boys read it... but also that girls read it. These ladies had some serious adventures... there's just a lot of adventures in the book, and if anyone wants to learn more they should go to DaringToDig.com. Like, there's a page about World War II Japanese balloon bombs and the woman who figured out where they were coming from based on the corals on them. There's a page about two lesbians - well you're not allowed to call them lesbians 'cuz it was before that time, so they were just companions... for 42 years - who explored the wild west and discovered discovered a crazy reptile. Annie Alexander and Louise Kellog, companions for 42 years. Alana: There's a page about Phoebe Cohen, who's a modern professor at Williams College who studies the origins of complex life and what that might look like on other planets, there's a page about the oil industry... there's just so many crazy crazy things, such a variety! I know a lot of kids like dinosaurs so I'm hoping that they'll get excited about all of this stuff too, and maybe about microfossils too? Meaghan: That might be a little bit of a stretch! I mean if you got into paleontology because of microfossils I guess somebody else potentially could find them cool… maybe. But I like that you work your own agenda into the story- Wear Pants! 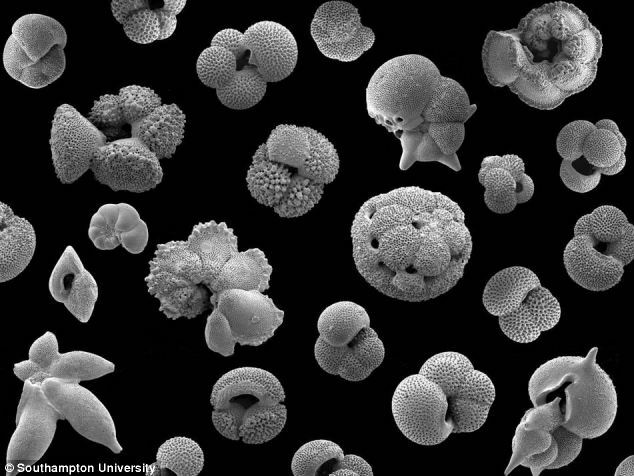 Look at Microfossils! Alana: There's so many invertebrates! And I really want the kids to be okay with it. 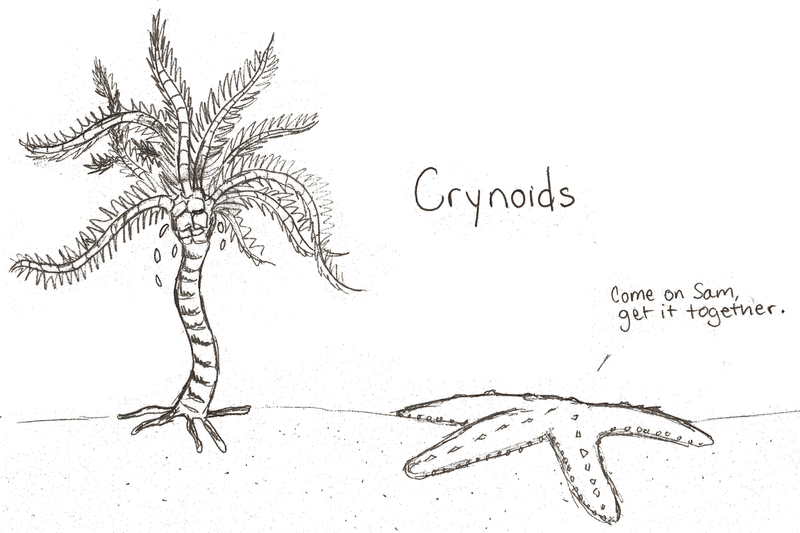 Invertebrates: let them woo you into science! Meaghan: So how do people get a copy of this amazing book? Alana: The best way you can get one is through the PRI website, but you can also order them through Amazon! Meaghan: Ok, last question. I have something I need your official opinion on! 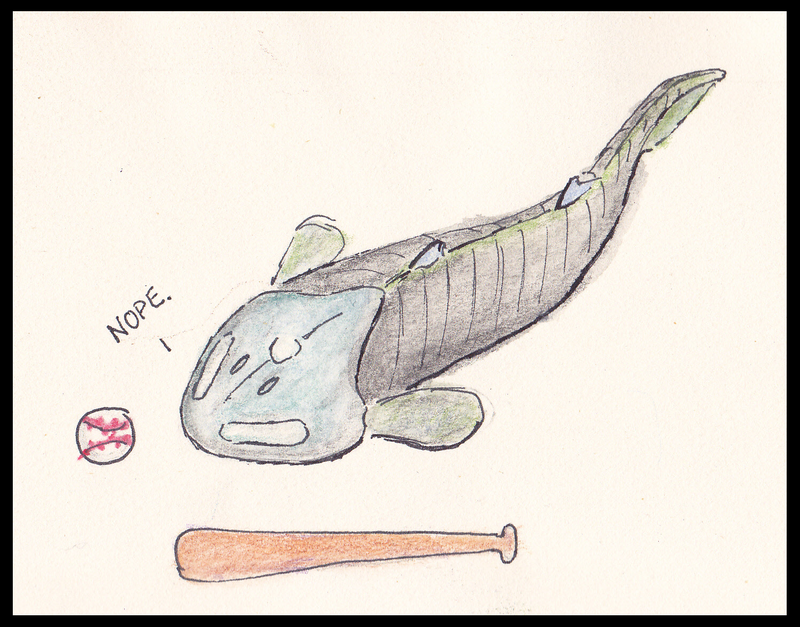 I also like to draw paleontology puns but I am not obsessed with cats, I am obsessed with extinct fish. So your challenge, should you choose to accept it, is to judge the following 4 osteostracan puns. Also you have to accept it. Alana: Yes it’s so cute! Alana: No! I don’t support that one! Alana: I feel like this one should just be offered as a reaction gif. Meaghan: Yeah, I feel like I should be incorporating it into daily conversation, like oh, I osteostracan’t do that. Alana: It should probably be a T-Shirt. 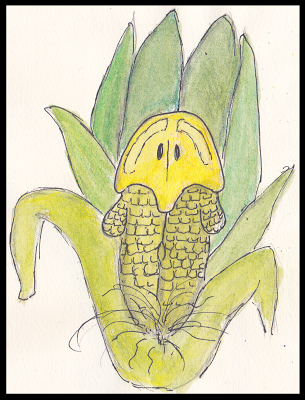 But yeah, I think with puns, the ones that make you the most mad are the ones that are the best, and the one that made me the most angry was the corn one. Meaghan: Well thank you for judging my osteostracan puns! I am so, so excited about this book - it combines my favorite elements of those old Highlights magazines that would focus on like, elephant evolution, but for ladies! Thank you so much for speaking with me, and everyone should get your awesome book via the Paleontology Research Institution! Or Amazon! Or they should just donate to Daring to Dig so we can see more awesome paleontology, and the rest of these awesome lady scientists and lady friendships! Hey! Do you like reading this blog? Interested in more content? Reward our desperate burning need to know people like us by following us on Instagram (@Mary_Annings_Revenge for Amy, @NessieLovesGobbles for Meaghan's dogs), Twitter (@MarysRevenge), or Facebook (Mary Anning's Revenge). Excellent goods from you, man. I've bear in mind your stuff previous to and you're simply too magnificent. I really like what you have got right here, really like what you're saying and the way in which by which you are saying it. You're making it entertaining and you continue to take care of to stay it sensible. I can not wait to read far more from you. That is actually a great website. Do I Even Want To Go To This Grad School?